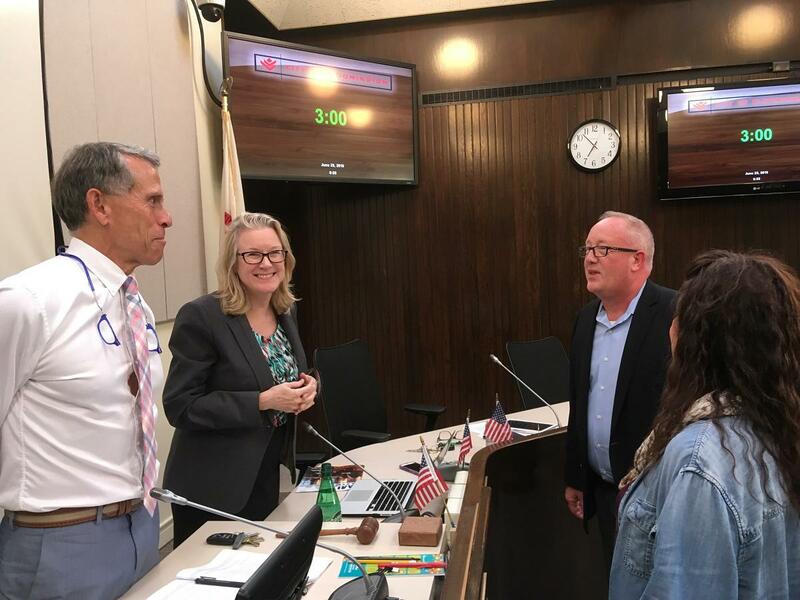 Tim Gleason and his wife, Becky, talk with Bloomington mayor Tari Renner and alderman Kim Bray before the city council voted to approve Gleason as city manager. 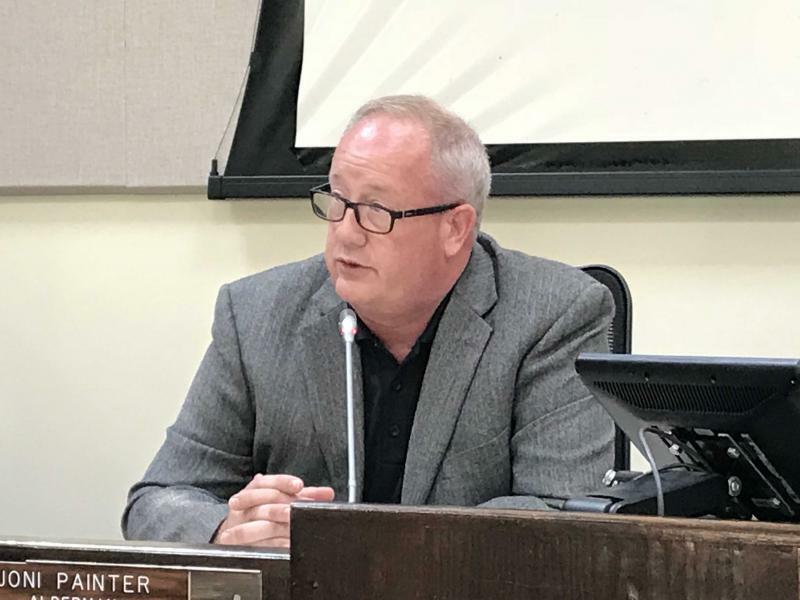 One week after announcing his selection, the Bloomington City Council on Monday gave Tim Gleason a standing ovation before unanimously approving his appointment as city manager. Gleason will start July 23 and will be paid an annual base salary of $185,000, which is $9,000 more than he was making as Decatur’s city manager. Gleason, 53, was chosen from 30 applicants, including two other finalists: Bloomington interim city manager Steve Rasmussen and Washington City Administrator Jim Culotta. Rasmussen returns to his previous post as assistant city manager. Alderman Diana Hauman said while she voted to support Gleason’s appointment, she had problems with the process in which the council deliberated the three finalists. “I just didn’t feel that we acted as a group. We acted as 10 individuals, versus a team or a group of people, or a council to make a decision,” Hauman said, though she declined to elaborate as those deliberations were made during closed session. Gleason wasn’t bothered by the suggestion. “I got her vote,” Gleason said. “At the end of the day, (it was) a unanimous vote and I very much appreciate the elected officials support." Gleason said he plans to work for Decatur until July 22. The city council unanimously enacted new rules intended to put limits on the mayor’s ability to put items on the council agenda. The plan requires the mayor and aldermen to submit a form outlining projected costs and staff commitments for a proposal to be discussed in a work session. The mayor and city manager previously had unilateral authority to place an item on a city council agenda. The city manager’s authority to set agenda items doesn’t change. Mayor Tari Renner said he won’t veto the measure but was upset there was no community discussion before the council voted. Alderwoman Joni Painter rebutted the mayor, saying the issue was first raised last fall. 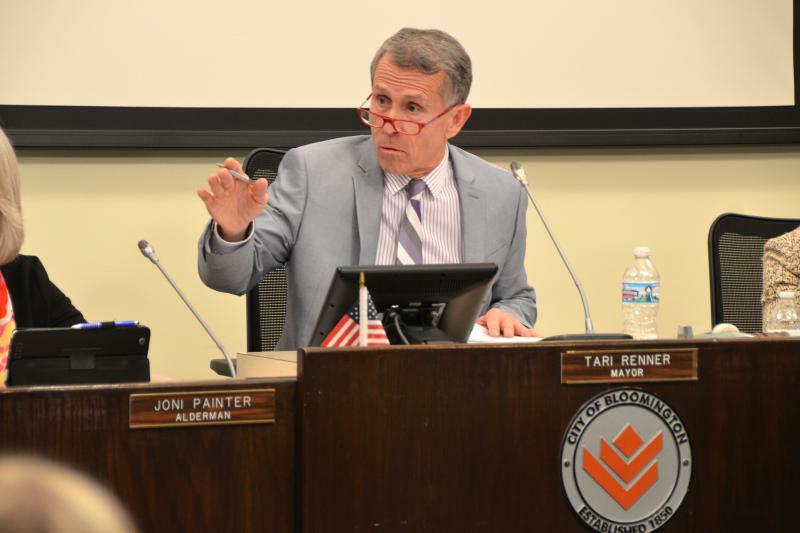 “(The city council) asked for conversations on this as far back as last November as we have repeatedly asked for conversations on this just to clarify, in case you forgot,” Painter told Renner. Renner noted there are other ways the mayor can get items on the agenda more promptly, such as through calling a special session. Hauman suggested the city council review the policy in six months to see if it’s worth continuing. The city council adopted a new policy to guide the city’s direction for approving tax increment financing districts as it OK'd a new TIF district for a three square-block area along East Washington Street, an area which includes the former Bloomington High School. TIF districts divert money raised through increased property tax revenue that a project generates back into the development. These districts can last up to 23 years. That longevity has upset District 87, prompting Bloomington to adopt a policy which seeks to limit each TIF when possible. 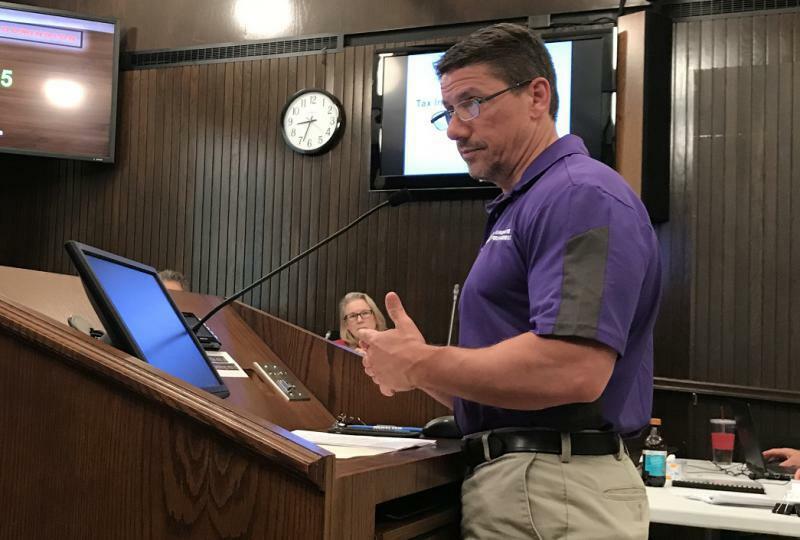 “(District 87) sees this as a compromise because it’s not requiring that we are never going to have another 23-year TIF, but at the same time, we are working to address those types of concerns,” City Attorney Jeff Jergens told the council. The East Washington Street project which the city approved last year includes plans by Iowa-based Iceberg Development Group to lease space on the first floor of the former high school for businesses and nonprofits, while converting the second and third floors into apartments for residents 55 and older. The city council also approved annual funding contracts for the Bloomington-Normal Economic Development Council ($100,000) and BN Advantage ($125,000), the multiagency effort which seeks to attract and retain and strong workforce in Bloomington-Normal. After a hotly contested debate, Bloomington aldermen decided Monday to postpone a vote on new guidelines that would clarify when the city uses tax increment financing districts (TIFs).